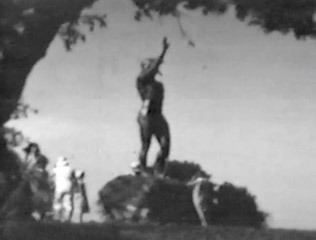 ABSTRACT: Chief Solano Monument Dedication Ceremony on June 3, 1934 in Suisun Valley, 4 miles west of Fairfield, CA. The statue was constructed by artist William Gordon Huff. Several thousand spectators showed up for the ceremonies that included speeches by Joseph Knowland, editor of the Oakland Tribune and commission member; Dr. Vance Clymer, Sachem of Massasoit Tribe, Improved Order of Red Men; Sen. McCormack of Rio Vista, and Gov. James Rolph Jr. The long program finally concluded with the unveiling by Mrs. H. Vance Clymer and a community singing of "The Star-Spangled Banner."